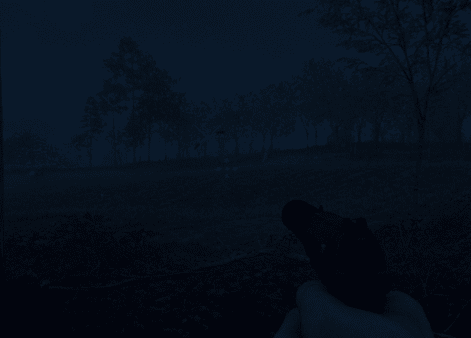 Maybe if the indicator only appeared when you point your gun/mouse at the enemy, or looked through binoculars, or something like that, to allow a more suspenseful hunter vs. hunted gameplay. Alternatively there could be a weapon mod / item that allows you to see the indicator while that object is equipped, as to avoid the indicator being completely overpowering. Or at least an option in the settings to toggle the indicator on or off. I like this idea because right now you just run around till the radar comes up. Agreed…this definitely ruins the suspense. The sounds and lights of the machines tell you what you need to know. There eyes/lights turn red…hide. I hate knowing when there near…like everyone has stated, move till you see the indicator, then stop. Turn this off in Far Cry and Ghost Recon Wildlands…and it’s a much better experience IMHO. I also hate the shout outs about loot and weapons in an area…why tell me this…let me explore…notes telling me a rifle may be in the barn should be suffice! If I miss it…I miss it! The indicator just needs to be removed tbh. (It’s a game about surviving on your wits). The number of enemies on patrol needs increasing. The drones need to call in more enemies, and be more effective at what they do. (Maybe an alert level similar to a wanted level in GTA or threat level Ghost Recon Wildlands). Lastly, the bots themselves need to be able to call in re-enforcements if you take to long killing them. But hey, maybe that’s just me as my favourite part of this game is when you get overrun by robots and really have to fight to survive. O, and please rework the respawn mechanics as right now there is no punishment for dieing and it’s way to easy to stockpile adrenaline shots so death becomes completely meaningless. I have played for about an hour now and must say the enviroments are amazing. I am from Stockholm and grew up in the eighties so I know how it should look. My biggest concern is the enemy indicators. When I play with friends we always play with the hud off or keep it to a minimal. As it is now I don’t wan’t play it so I wait and hope this will be fixed soon. I played the beta and found the lack of indicators annoying. Then again, I don’t think the sound design was fully implemented so the enemies were hard to hear. In real life you use more senses than a game can convey, so I’m gonna make the outrageous claim that an enemy marker makes sense. It could’ve been better implemented though. My suggestions would be to make the indicator static instead of filling so you don’t know how close you are to being discovered, and when enemies are alerted it stays the same colour to keep some level of surprise. At the very least, an option to toggle it on or off would be nice. First of all. As it is now the indicator is not working verry well. As of keeping it or removing it… I’m kind of stuck between both sides on this one. If it is to be removed I think the sound from mobs should be better / easeir to notice if you are standing still in game. Even with 5.1 Headphones I have not really noticed sound from the robots that could point me in the direction of where they are… and I don’t dare to turn up the volume more because of damaging my eardrums when firing a weapon. Maybe they could put the enemy Indicator as a skill in one of the skill-trees? This is something we’ve been tracking feedback on, personally I think just making it toggleable so you can choose makes the most sense. I like this idea. That way you can actually run around a corner and get surprised by a mechanic. However, since the mechanics are way op knowing where you are even from far away/behind large object/underground this would make it quite hard to be stealthy since they practically know where you at all times as is. The only way I’ve found to disable the enemy indicators is to use this mod that let’s you toggle the HUD on/off with Capslock. It makes the game so much better if you value immersion. And you can quickly toggle the HUD on whenever you need to check your current Health or Ammo. We have been playing with this mod aswell and it makes the game so much more exiting and forces you into teamwork and tactics. The best solution for me would be crosshair and enemy indicators off at all times and the ability to toggle ammo, health and compass. This is a nice solution, but I would like to point out the number of xbox / ps4 players who don’t have access to this mod. The only way to remove the indicator would be through in-game options. Otherwise I would be completely satisfied with this mod. I made a small mod that only removes the enemy indicator, so if you play on PC you can try it. edit: will add a version without crosshair as well once I get time off.